Temporary elimination of service in Camino de Beas due to road works from Monday to Friday at 15:30 hours. 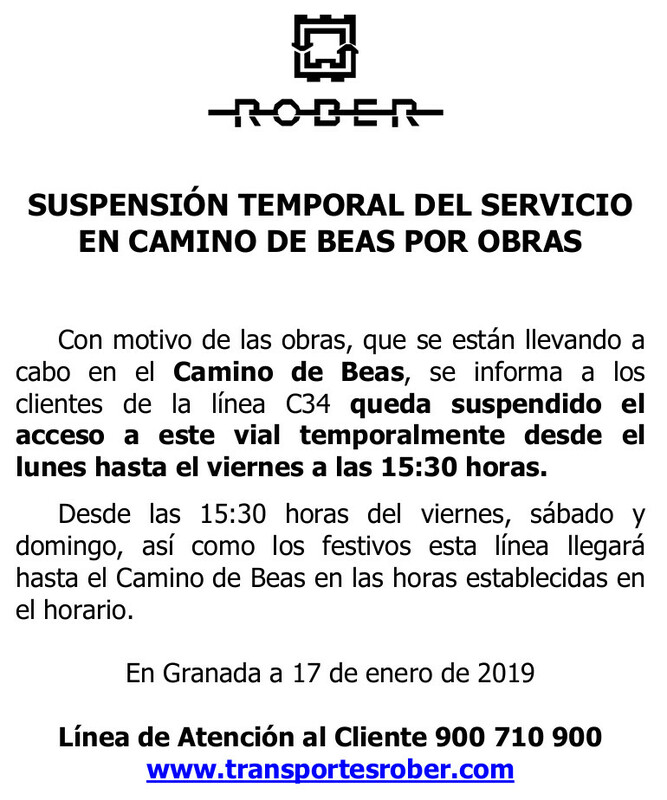 Bank holidays and weekends will arrive to Camino de Beas at designated hours. This change of schedule begins on 17 January 2019 and will end aproximately in three months. Itinerary ends in Camino de Beas from Puente Mariano. Due to road works in Camino de Beas, customers of bus line C34 are informed that access to this road will be temporary eliminated from Monday to Friday at 15:30 hours. From 15:30 hours of Friday, Saturday and Sunday, and bank holidays as well, bus will arrive to Camino de Beas at designated hours on schedule. Works on the road are particularly significant, and prevent the minibus from turning around. Check all info at Transportes Rober.